The one enduring truth, regardless of circumstance – rich or not, successful or not, religious, philosophical, it doesn’t matter – you will die. From the beginning of time, through evolution and human existence, all the way until the end, death is the one universal inescapable commonality. Kings or peasants, brilliant or stupid, everyone dies or is dead. Some try not to think about it. But for others, the certainty of death is kept at the forefront of thought. Why? So that they might really live. In this article, we’ll explore the history of this seemingly haunting, but actually inspiring, phrase as well as where it came from and what it means. 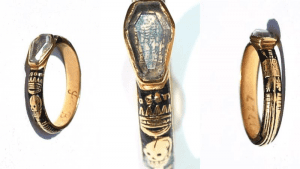 We’ll show you how it has evolved through its many forms of practice and interpretation in literature, art, fashion, and present day popular culture — where thousands of people carry Memento Mori coins in their pockets or have adapted other physical reminders to keep the thought of death with them at all times. In Meditations, Marcus Aurelius wrote to himself: “You could leave life right now. Let that determine what you do and say and think.” The emperor considered it imperative to keep death at the forefront of his thoughts. In doing so, the world’s most powerful man managed the obligations of his position guided by living virtuously NOW. 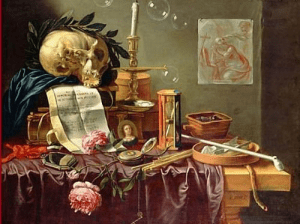 The Stoics used Memento Mori to revitalize life, and to create priority and meaning. They treated each day as a gift, and reminded themselves constantly to not waste any time in the day on the trivial and vain. 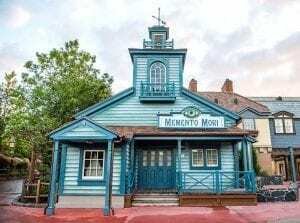 Memento Mori is believed to have originated from an ancient Roman tradition. The slave served to remind the victor at the peak of glory, this god-like adoration would soon end, while the truth of his mortality remained. Of the seven ancient wonders of the world, only one remains undefiled – the Great Pyramid of Giza. How the ancient Egyptians transported over 170,000 tons of limestone to erect the pyramid continues to puzzle archaeologists, but the why is better known. Preceding the pointed smooth-sided pyramids were bench-shaped mounds called mastabas, built atop the tombs of early kings and pharaohs. The Great Pyramid displays an advancement aesthetically, but not symbolically. An estimated 20,000 civilians contributed to the 20 year construction of the pharaoh Khufu’s burial chamber – a structure memorializing the fate shared by the royals and the common. Excavated mummies, tombs, and pyramids reveal that remembering death was entrenched in ancient Egyptian culture. Egyptologists maintain the preservation of dead bodies and the building of elaborate death chambers were an act of celebrating life, and a reverence for its ephemeralness. In the height of celebration, Egyptian custom was to set remembrance to the frailness and fleetingness of festival. Through the visual of the skeleton and the pronouncing of the chant, celebrators reeled in the jollity to acknowledge the moment would soon pass so not to take it for granted. Mindfulness of death is a central teaching in Buddhism. The meditative practice maranasati, meaning “death awareness,” is considered essential to better living. It brings recognition to the transitory nature of one’s physical life, and stimulates the question of whether or not one is making the right use of their fragile and precious life. 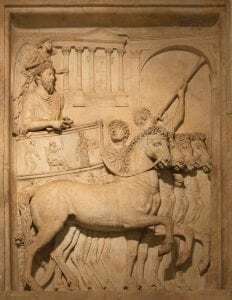 The fall of the Roman empire in the fifth century lead to a tumultuous period of conflict, plague, and political crisis. Without a strong central government to maintain order, the Catholic Church surged as the most powerful institution. Kings, queens, and other leaders derived power through their allegiance to and protection of the Church. Devotion was proven by the building of grand cathedrals, churches, and other ecclesiastical monuments. Funerary art displayed to compel visitors to reflect on the gift of life. Crucifixes and tombs were most common. Remembering the inevitability of death is a core Biblical theme. It remains prevalent today far beyond the written word. The Late Middle Ages was a period of devastation. 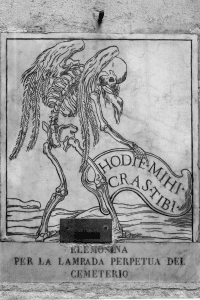 A catastrophic plague, the Black Death, devastated Europe, killing an estimated 25 million people – one-third of the population. 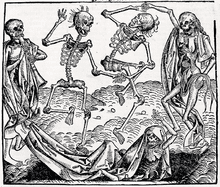 Out of the grim horrors and fight for survival grew an art genre called Danse Macabre, meaning Dance or Death. 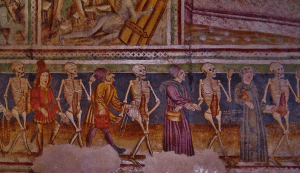 Like plague, Danse Macabre illustrates the all-conquering power of death. 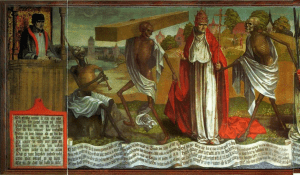 Paintings include kings with peasants, young with old, to convey that death comes for everyone. Life is fleeting so best to not waste it on meaningless goods and pleasures. That’s the message behind vanitas art. 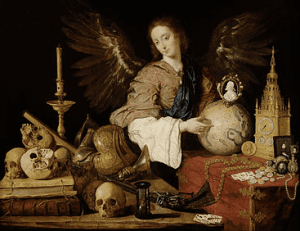 Inspired by the first chapter of Ecclesiastes (“vanity of vanity, all is vanity”), Dutch Golden Age artists of the 17th century used still-life as moral instruction. Artists emphasized the emptiness and futility of earthly items. 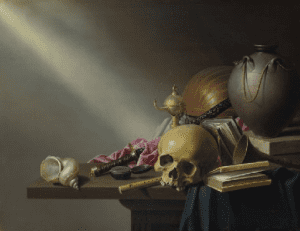 Skulls, candles, hourglasses, watches, rotting fruit, wilting flowers, and fraying books sat atop a table to remind viewers just how precious life is. Plagues, wars, and massacres aside, people of the Regency and Victorian eras dealt too with some of the highest infant mortality rates in history. Without vaccines to control illness, mothers lost the life of their newborn, and sometimes their own, at an alarming rate. 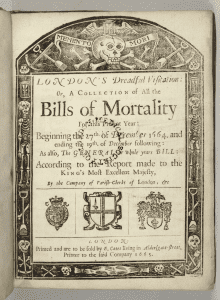 Documentation started to be kept in a yearly Bill of Mortality. To say death was on the public’s mind would perhaps be an understatement. The haunting reality of life’s uncertainty showed itself in many forms: art, literature, architecture, and a new trend, jewelry. 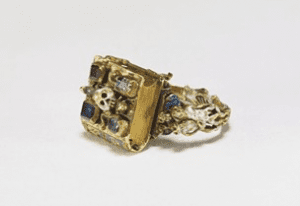 Memento Mori rings were worn by everyone from Queen Victoria to the impoverished. 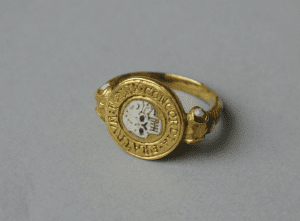 Skeletal bands and skulls wearing a crown reminded wearers that death is the master of all. 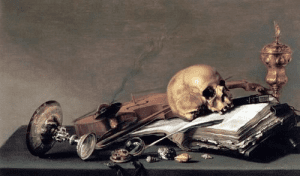 While Memento Mori has fallen from consciousness compared to its historical relevance, mortality motivation is practiced modernly in fueling successful entrepreneurs, artists, athletes, authors, among others. 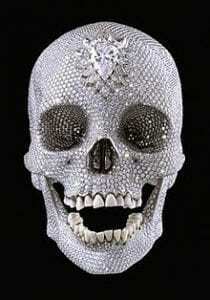 In 2007 Damien Hirst created one of the more famous modern art examples of Memento Mori with his For The Love of God, featuring over 8,000 diamonds laid out on a human skull. The piece sold for a reported £50 million. 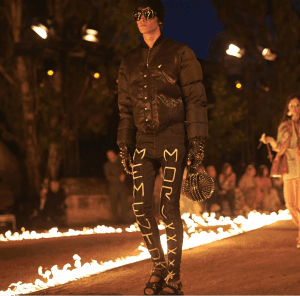 The world-renowned fashion brand, Gucci, recently used Memento Mori as a theme in their Gucci Cruise 19 show. The show was held in a graveyard in Arles, France. 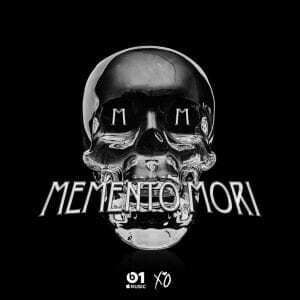 The multi-platinum and three time Grammy winning R&B singer The Weeknd, titled his 2018 radio show “Memento Mori,” featuring his favorite music that’s inspired by late nights. Today, the typical person doesn’t think about death at all because it’s uncomfortable, sad or scary. Fortunately, we’re no longer cavemen afraid that we’re going to be eaten by a lion, or ancient Romans afraid we’ll be murdered by a gladiator, or Medieval sires afraid we’ll fall victim to plague. Unfortunately, however, as the world has gotten safer and better, we start to think that we’re going to live forever and that things are always going to go exactly our way. The Stoics would say that death is what gives life meaning – it’s the cap at the end that helps us make the most of the time we’ve been given. The truth is, we have all been given a fatal diagnosis. The doctor who pulled you out of your mother knew for certain that you were going to die, he just didn’t know exactly when. And neither do you. So keep the reminder of Memento Mori with you. Don’t waste your time on trivial, pointless things. Don’t take for granted the time you have. Thank you! I appreciate the positive feedback. Death, is without a doubt, the only constant.